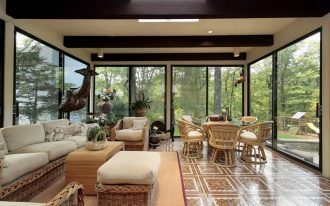 Scandinavian, in home design & architecture, speaks about eclectic and stylish look which is mostly applied for all home interiors and exteriors. 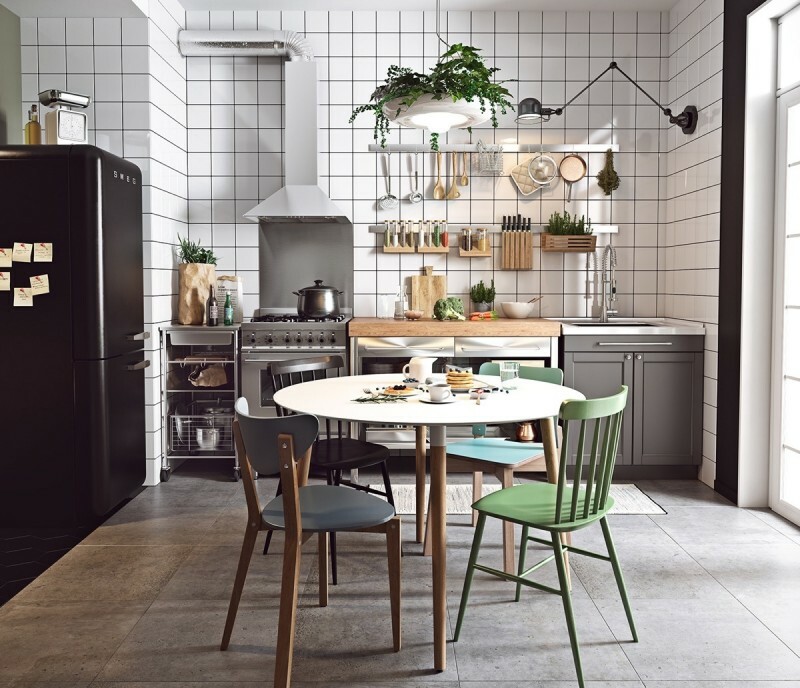 Kitchen as one of targeted space decorated in Scandinavian style would be overlooked and it can be more than light wood floors, white walls, bright cabinets, dreamy pastels, clean lined tiles, and hanging green plants. 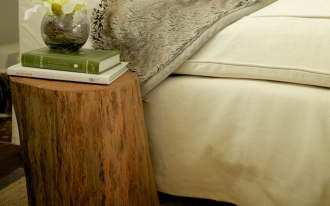 Take this wonderful home tour and start to get inspired. 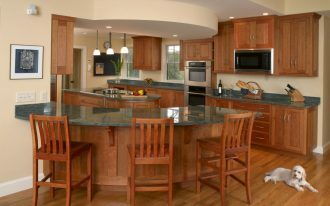 White subway tiles and cabinetry makes a bright & light space and a central block butcher table here really enchants me; creates one and only colored piece in high intense of natural wood. Stencils give the authentic character in chairs, and the pendant add distinctive shaped showcasing a drop design. 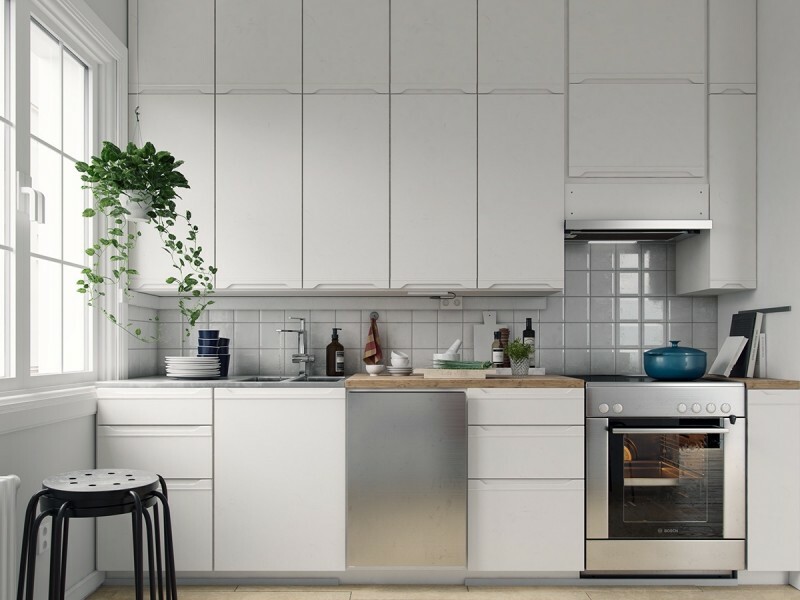 The last, the Scandinavian elements softly fills behind white subway tiles. Very clean and modern. 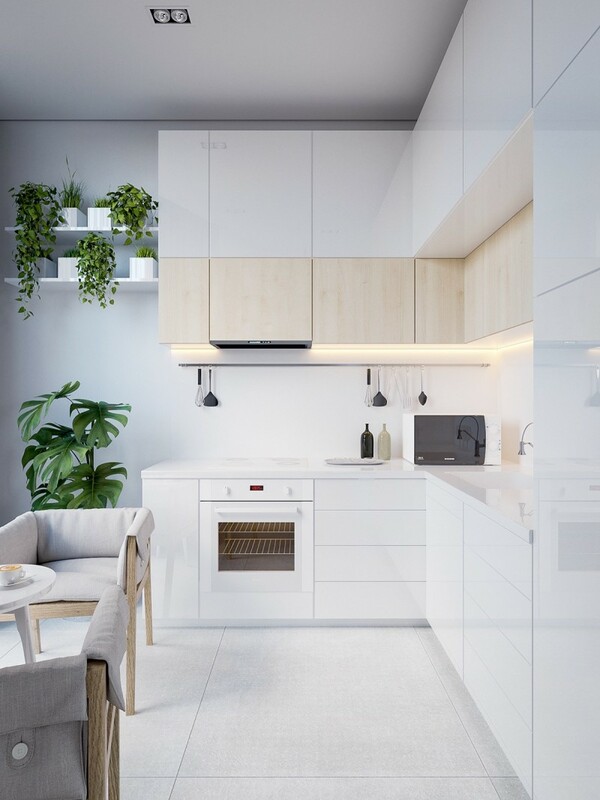 Create a little jungle look by adding small hanging plants and other greens in your kitchen. 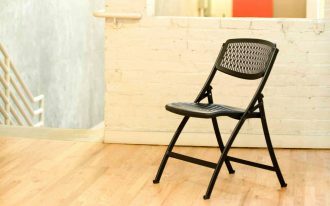 Make it more unique and attractive with mismatching chairs. 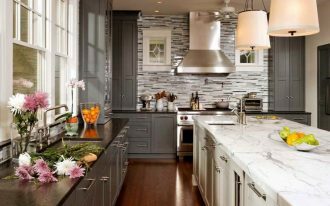 Gray cabinetry, of course, brings a contrast against the white backsplash of kitchen. 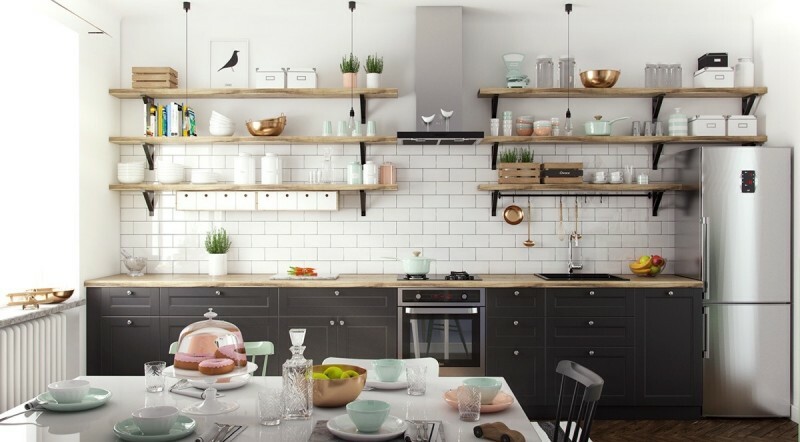 Take black to this Scandinavian kitchen for darker scheme. 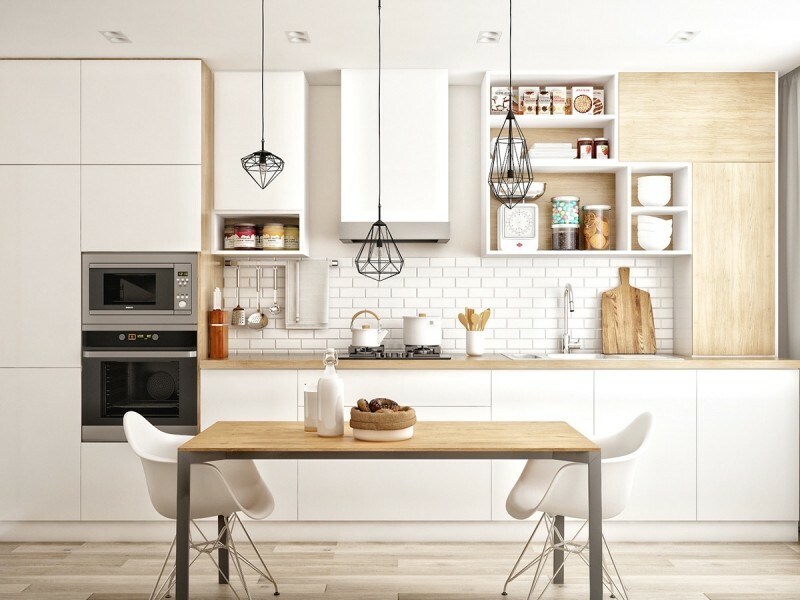 If you really love industrial style, you may add industrial element like these open shelves and industrial pendants to your kitchen. 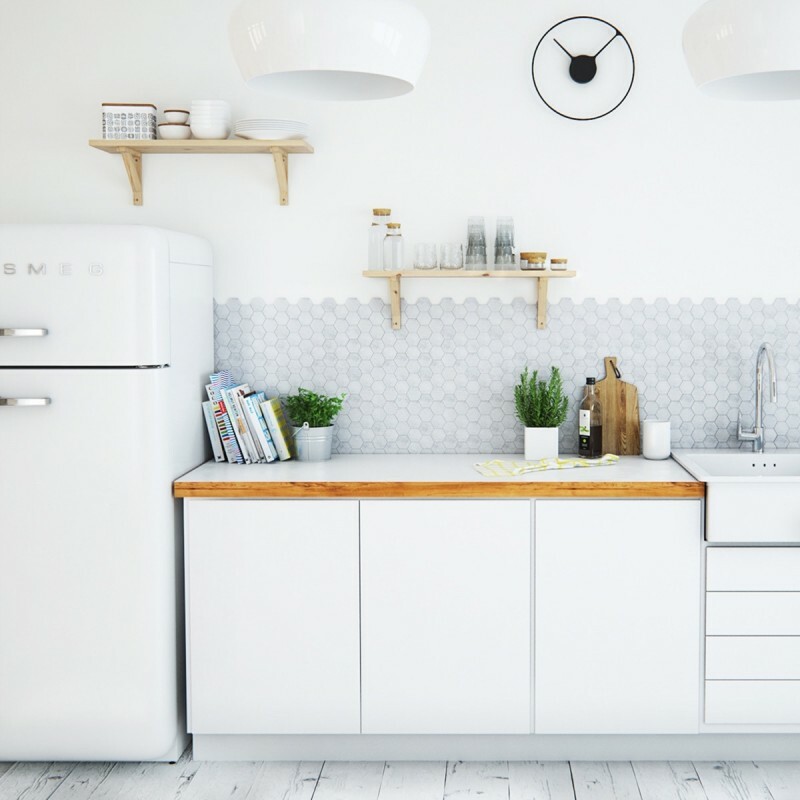 And these chrome oven and fridge obviously give a classic look. Really adorable. Scandinavians means simple and minimal. 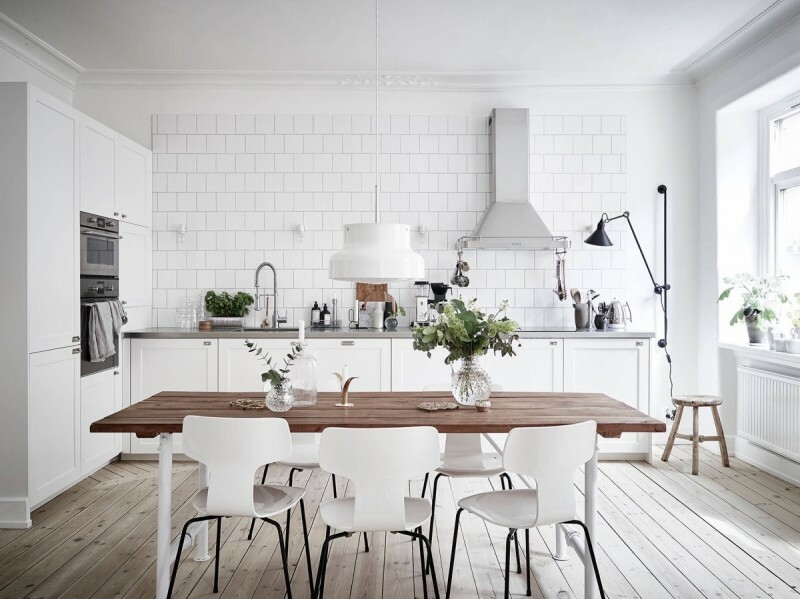 Light wood floors and white furnishings are enough to create a scandinavian style. Just add something stunned like striped rug and large bulb pendant as the centerpieces of space. 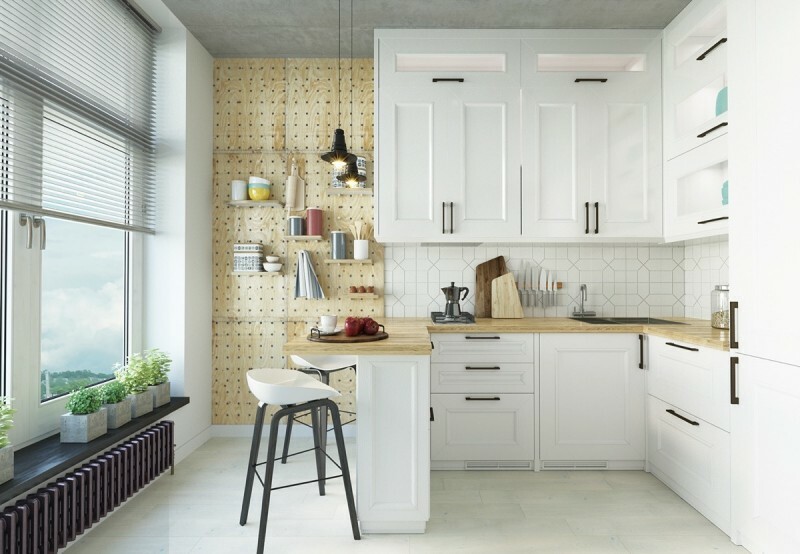 Get simpler Scandinavian concept with chrome accent applied on the whole kitchen cabinets. The hanging plant here directly introduces the nature that has been brought into home interior. Infuse natural appeal simply with the series of potted green plants and make them an accent by placing them exactly beside the cabinets. Their green tone looks obvious against the clean & light interior. 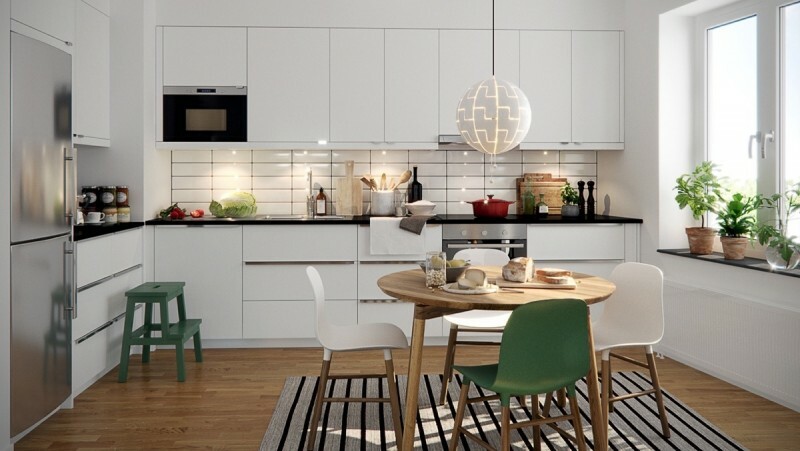 A scandinavian kitchen idea for smaller open space. 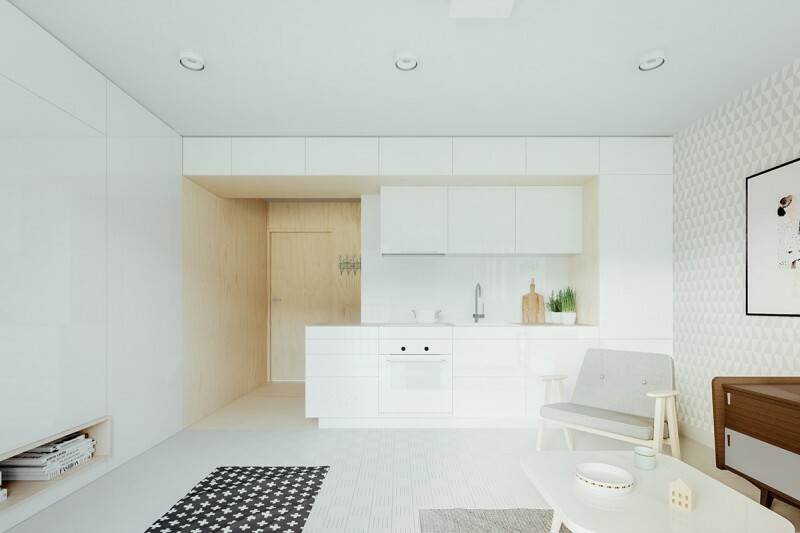 White is chosen as the primary tone as it’s easier to create a larger visual effect. 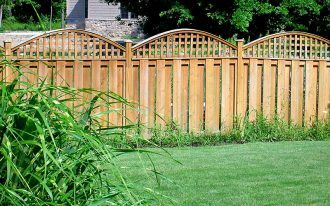 Lighter wood chamber clearly adds the natural color without distracting the existed tone. Perfect! 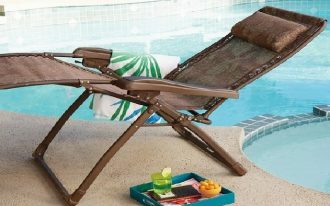 Unfinished & rough wood element gives the real rustic. In this idea, we’ve discovered rustic applied perfectly on interior pillar and table, and they precisely fit the overall Scandinavian setting. Really recommended for those who want to get a little bit rough texture in light & bright Scandinavian interior. 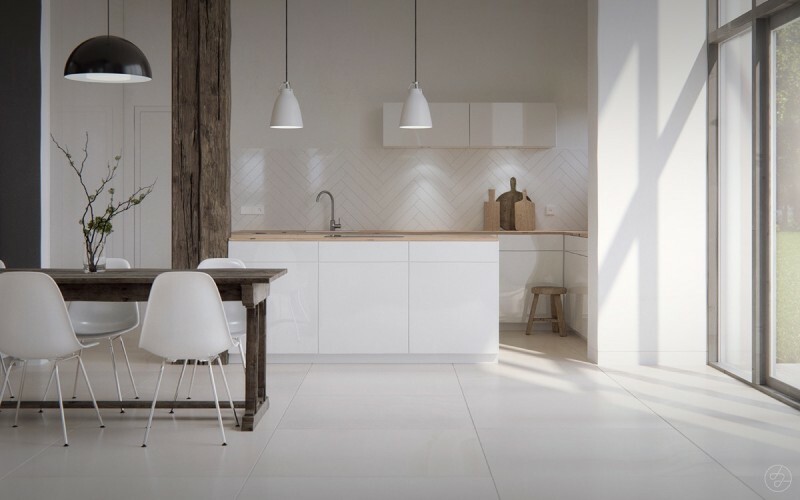 Light wood and white are the Scandinavian’s signatures. They make the interior stands out. 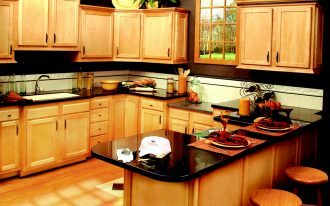 Black clock, potted plants, and wood cabinets’ edging instantly make the visual attractiveness. 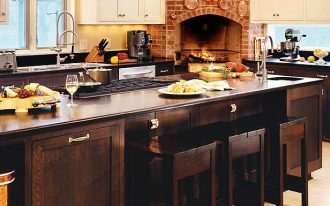 What a classy kitchen! The drilled wooden panel has attracted me. It’s so unique and offers huge practicality when the shelves mounted on.